Our leans went 2-3 yesterday on what was another surprising night in the NHL. All 5 games were won by road underdogs, including the Islanders upsetting the Ducks in Anaheim. We were torn between Islanders in regulation time and the First Period Under 1.5 in that game, feeling New York would come out with a better defensive effort. We suggested the wrong one as the Isles won the game 3-2 in a shootout but the teams combined to score 3 goals in the first period. Whopping 12 games in the NHL tonight! We’ve got one circled as our favourite bet of the night, and we’ve also written breakdowns and our leans for all the other ones. Buffalo looks like the hotter team here, having won 2 straight games while the Red Wings have dropped 4 straight and 9 of their last 11. But then you take a closer look at Buffalo’s wins over Pittsburgh and Calgary. Saturday, the Sabres needed a Herculean effort from goaltender Anders Nilsson, who stopped 46 of 47 Penguins shots as Buffalo eked out a 2-1 shootout win. Then Monday, the Sabres benefited from a Calgary parade to the penalty box to score 3 power play goals in a 2-minute span en route to a 4-2 win over a tired Flames squad. The bottom line is that Buffalo has still scored only 5 even-strength goals in its last 8 games, and it’s topped the 1 goal plateau in regulation time just once in that span. Detroit has been off since Sunday, licking its wounds after yet another loss. The Red Wings are a proud franchise that always expects a lot from itself, and they should be looking at a visit to Buffalo as an excellent opportunity to turn things around. It doesn’t hurt that the Wings have won 7 of their last 8 trips to Buffalo, or that they’re 27-5-1 in the last 33 meetings as well. Reasons to bet Winnipeg: The Jets might finally be fresh after enjoying 2 days off between games for the first time since Oct. 19. Winnipeg has won 6 of the last 8 meetings. Reasons to bet Minnesota: The Wild is 5-3 at home while the Jets are 3-6-2 on the road. Minnesota has allowed 7 regulation time goals in its last 5 games. 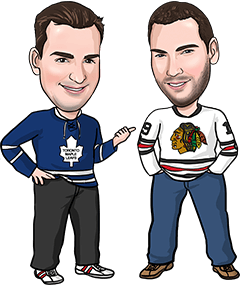 Reasons to bet Toronto: The Leafs have allowed just 7 goals in their last 4 games and held each of their last 3 opponents under 30 shots. Tough situational spot for New Jersey, playing first home game after 4-game west coast trip. Reasons to bet New Jersey: The Devils are unbeaten in regulation time at home (6-0-1) while the Leafs are 1-5-2-1 on the road. Toronto is playing for the second straight night. Reasons to bet Pittsburgh: Penguins should be motivated to avenge 5-2 loss to Rangers Monday in Pittsburgh, when Pens blew 2-0 lead. Pittsburgh has won 7 of last 9 versus New York. Reasons to bet New York: Rangers are 8-2-0-1 at home and 12-4 in their last 16 overall. Pittsburgh has dropped 3 of its last 4 games and 4 of its last 6. Reasons to bet St. Louis: The Blues are playing their best hockey of the season, riding a 4-game win streak. Washington is just 3-3-1 in its last 7. Reasons to bet Washington: The Capitals are 6-3 at home and haven’t played since Sunday, while the Blues played last night in Boston. Washington has allowed 5 regulation time goals in its last 4 games. Reasons to bet Calgary: The Flames are 5-5 on the road and have allowed just 6 even strength goals in their last 5 games. Reasons to bet Columbus: The Blue Jackets are 7-0-1 in their last 8 home games and have earned points in 10 of their last 11 games overall (8-1-2). Calgary is playing its 6th game in 9 days. Reasons to bet Philadelphia: Flyers won 3-1 in Florida last night and are 5-3-2 in their last 10. Philadelphia has allowed just 10 regulation time goals in its last 5 games. Reasons to bet Tampa: The Lightning is 5-2-0-1 at home and has won 8 of its last 9 home games against the Flyers. Tampa has allowed 7 goals in its last 5 games. Reasons to bet Dallas: The Stars beat Minnesota 3-2 in OT Monday and have now collected points in 7 of their last 9 games. Dallas has beaten Nashville in 7 of the last 8 meetings. Reasons to bet Nashville: The Predators are 6-1-0-1 on home ice while the Stars have won just 3 times in 10 road outings. The Predators have allowed 1 goal or less in regulation 5 times in their last 7 games. Reasons to bet Edmonton: The Oilers may finally be back on track, winning their last 2 games by a combined 10-2 score after losing their previous 5 games. Colorado is just 4-4 at home. Reasons to bet Colorado: The Avalanche also comes into this game on a 2-game winning streak, posting upset wins in Minnesota and Columbus. Colorado is 6-2 in its last 8 against Edmonton. Reasons to bet Vancouver: The Canucks have remembered how to score again, collecting 19 goals in their last 6 games. Vancouver has won 6 of its last 7 against the Coyotes. Reasons to bet Arizona: Arizona has held opponents to 2 goals or less in regulation 7 times in its last 9 games. The Canucks are 1-6-0-1 on the road. Reasons to bet Chicago: The Blackhawks are 10-3 in their last 13 games and will want to bounce back from Monday’s 5-0 loss in Edmonton. Chicago’s won 3 of its last 4 meetings with the Sharks. Reasons to bet San Jose: The Sharks snapped a 3-game losing streak Monday with a 4-0 win over the Devils and have outshot their last 2 opponents 86-52. Chicago’s playing its fifth straight road game and has won just 3 of its last 6. Reasons to bet New York: Islanders snapped their 4-game losing streak with a 3-2 shootout win last night in Anaheim. New York has held 4 of its last 6 opponents to 2 goals in regulation time. Reasons to bet Los Angeles: The Kings are 7-2 at home while the Islanders are 1-4-1 on the road. LA has won 3 straight, outscoring its opponents 11-6.